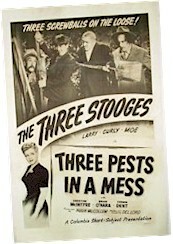 Three 3 Stooges Vintage Movie Posters, RARE Autographs & ORIGINAL VINTAGE Memorabilia and Collectibles. 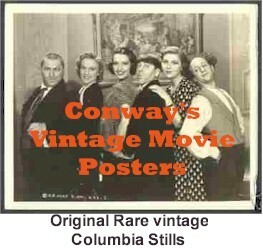 most exciting original Stooge memorabilia material here, on our Three Stooges Collection web site!! VERY RARE ORIGINAL Studio Photos!! "No Census, No Feeling" & "Three Pests in a Mess" - 1940/1945 - VERY RARE ORIGINAL Columbia Shorts - the "Curly years". "Swing Parade" - 1946, Stunning COLOR lobby card. GREAT shot of Stooges! Vernon Dent - 1920's - RARE - The popular Stooge nemesis. Here he appears in an early silent era. MUST SEE!! Ted Healy - The infamous Stooge founder. He was there ruthless leader in the early days. A very rare title card!! Also, signed photo and 1930 Still Photo - MUST SEE! ORIGINAL Press Release Photos/Stills from early 30's to mid 40's. MUST SEE! "Gents in a Jam" - 1952, RARE ONE SHEET ! "Listen Judge" - 1952, ANOTHER Original Vintage One Sheet!! "Rumpus in the Jungle" - 1956, Shemp would not live to see this finished, but another great Stooge Short Classic! "Spooks" - 1953, NICE vintage one sheet for this 3-D classic!! 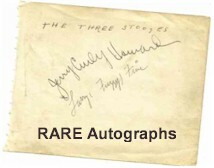 Incredible RARE Authentic Autographs - Curly, Moe, Larry and Shemp!! MUST SEE! FULL SIGNATURES - with one-of-a-kind inscriptions!! MUST SEE!!! Moe Howard - RARE Handwritten letters to long time fan! 1968 - NICE!! Moe Howard - Here are FOUR incredible unique signed photos!! Moe Howard - A special Gift He/She/you will NEVER forget !!!! SIGNED personal check Professionally and very beautifully framed, see image $450 NO longer for sale. For display only. Gum Cards, Wrappers, Comics and other Unique items: In 1959 and 1965 a complete gum card set was issued for the Three Stooges. Both sets are highly sought after. ORIGINAL Studio Promotional Press Photos - from the 30's!! MUST SEE!! 1959 Fun House Game - NICE!! RARE!! 3 Stooges - RARE !! 1959 Golden LP Record. This is the first Stooge LP I have ever seen.